A few days ago my sister in law Rakshabhabhi sent a few pieces of the granola bars she tried out and a very tender and fresh bottle gourd. The granola bars were yummy and tasted different from mine as she had added dried apricots and dried dates (khajur) to the mixture. As for the bottle gourd, doodhi or lauki, it probably landed up at my house for a specific reason. The reason was a kofta curry. twice I had bought doodhi or lauki from the market and twice it was a bit seedy so it was used up in dangellas and theplas. This time, the lauki was really nice with no seeds and very tender. So today, I gathered rest of the ingredients and made a very delicious, rich and creamy kofta curry for lunch. Rich and creamy it was as Ajay has just informed me that he doesn’t need any dinner, only fruits. An ideal dish to make when you have guests around and you need to make a vegetable with gravy. Kids will love this curry as they will never guess that its made from lauki. Today I made the kofta curry but instead of deep frying the kofta I made them in the paniyaram pan. Its so much better than frying them. After putting the rolled balls in the pan with just a drop of oil, I covered the pan and let them cook over low heat. When done, turn them over carefully to cook the other side. I let them become a bot more crunchier so that when I add them to the gravy it doesn’t get really soft. The curry in the plate is with fried koftas and the one in the bowl is the with the koftas cooked in the paniyaram. Can you notice any difference? The taste was the same. Squeeze out the water from the shredded lauki. Save the water. 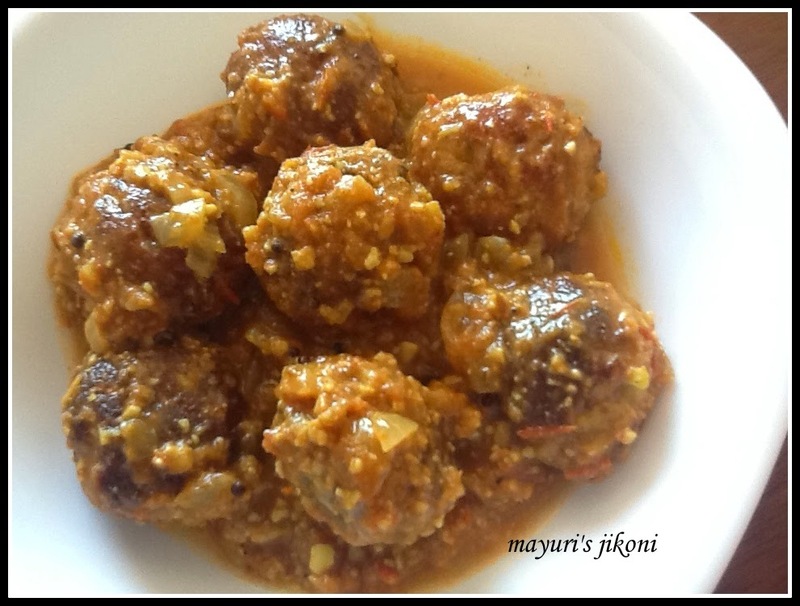 Add rest of the ingredients of the kofta to the lauki (except the oil for deep frying). Mix well. Take a tablespoon of the mixture and roll it out into a ball. Do the same with the remaining mixture.You will get about 30 to 32 balls. Heat oil in a deep frying pan, wok or karai over medium heat. Put a tiny bit of the lauki mixture into the oil. If it comes up immediately, the oil is ready. Fry the balls, 8 to 10 at a time. Keep turning them in the oil so that they brown evenly. When they are golden brown in colour, remove with a slotted spoon and keep them in a colander till required. Lightly roast the cashew nuts in pan till they are slightly pinkish. Let the nuts cool for a bit and then grind it into a coarse powder. In a small bowl mix dhana jiru, red chilli powder, turmeric powder, asafoetida, star anise powder, cardamom powder,clove and cinnamon powder. This is the spice mixture. Heat oil and ghee in a wide pan over medium heat. When it is hot, add cumin seeds. As they begin to brown slightly add the onions. Saute the onions till they become light brown in colour. Add garlic paste and and stir fry till it begins to turn light brown. Add ginger and chilli paste. Mix well. Add the cashew nut powder and the spice mixture. Keep on stirring till the cashew nut powder becomes pink in colour. Add the tomato puree, water, the water squeezed out from the lauki and salt. Mix well. Cover the pan an reduce the heat to a low setting. Let the gravy simmer for 10 minutes. Turn the heat off. Add the cream and mix well. Just before serving, add the koftas and mix well. Garnish with chopped coriander and serve with hot rotis, parathas or rice. Add moong dal flour instead of chana flour if anyone is allergic to chanas. As soon as you mix the kofta mixture, fry the koftas.If you leave the mixture for too long it will become watery. Test one kofta in the hot oil. If it falls apart, add a bit more of the besan flour. Adjust the amount of spices according to your taste. If you use tinned tomatoes, you may need to add a bit of sugar as tinned tomatoes are sour. If you have cooked the gravy ahead and it becomes too thick before serving, add a little bit of water when you heat it up. To make your own clove, cinnamon or star anise powder, dry roast them individually in a pan for a minute or to. Let it cool down a bit and then grind in a coffee mill or grinding mill. For this recipe I prefer to use ready made paneer because it is a bit hard as opposed the home made one. Beena not too healthy because of the fresh cream but can omit it. I have made lauki koftas but never added paneer.. will try out this version when I get a chance .. we don't get lauki in Brazil.